Openreach (BT) has announced that a further 59 locations across the United Kingdom will be the next to benefit from their on-going deployment of 330Mbps capable hybrid fibre G.fast (ITU G.9700/9701) broadband technology, which aim to cover 10 million homes and businesses by the end of 2020. Until today the operator had only confirmed a total of 46 locations for the new service, which largely reflected the coverage of their initial large-scale G.fast pilot that now reaches more than 1 million premises passed. Since then several ISPs have launched related packages, although BT and TalkTalk remain the only major providers with a G.fast service on offer (e.g. BT Ultrafast and TalkTalk Faster 150 Fibre). In case anybody has forgotten, G.fast works in a similar way to VDSL2 based Fibre-to-the-Cabinet (FTTC) technology by running a fibre optic cable to your local PCP Street Cabinet, which is then fitted with an extension “pod” to house the line cards (this can handle up to 48 ports, but it should eventually extend to 96). After that the G.fast service reaches your home via the existing copper cable. Aberdeen Denburn, Acocks Green, Altrincham, Aylesbury, Bedford, Birmingham Central, Bishops Stortford, Boscombe, Bowes Park, Bury St. Edmunds, Bury, Byfleet, Cardiff, Carlisle, Chelmsford, Chester, Cosham, Didsbury, Erdington, Gipsy Hill, Guildford, Hampton, Harlow, Harrogate, Headingley, Heywood, Kingston, Lancaster, Leamington Spa, Leeds, Llantrisant, Maidstone, Market Harborough, Mile End, Morley, Narborough, North Finchley, Paignton, Plymouth, Rugby, Shipley, Slough, South Kensington, Southampton, Southend Town, St Albans, Stockton Heath, Swadlincote, Tamworth, Taunton, Telford Wellington, Tunbridge Wells, Walthamstow, Weston Super Mare, Windsor, Wolverhampton, Woodhouse (Berkshire), Woodley, York. Maybe I'm under estimating the amount of work that needs to be done, but I thought G.fast deployment would have been a lot faster than this, especially when they are only attaching pods to existing cabinets. I thought it would just be a process of going to all the cabs and adding the pod on? And why is York getting G.fast so early on when they already have FTTP? OpenReach actively target areas with good competitor coverage. York FTTP is Talktalks, not OpenReach's. It is just a case of bolting on a pod at the cabinet. Activation can be delayed waiting for exchange Harrisburg being upgraded. There are thousands of pods to install though. This is while OpenReach are also deploying FTTP in other areas, their FTTPod orders and there's still some FTTC being deployed. Throughout all these new deployments they still have to maintain the existing network. The aim is 10 million homes and businesses by 2020. They are on target to meet this. Not in my area, and I would suspect I'd be over or borderline for the 500m range. 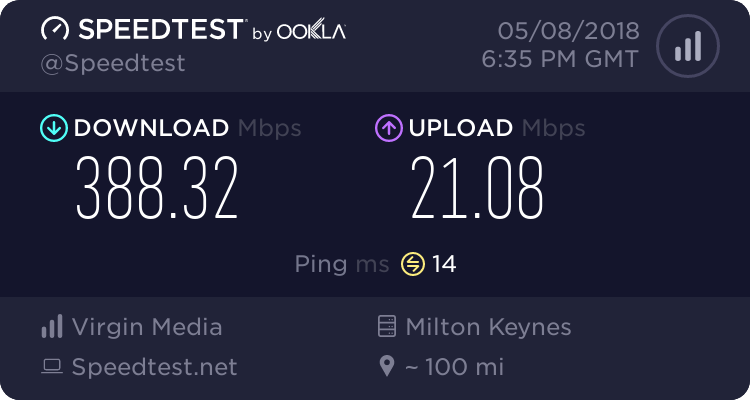 Same here, my town isn't listed and there are perhaps two or three areas in the town (one about two streets away from me) which are already FTTP. I'm hopeful this means while I will have to wait a bit longer that I could be in a queue for FTTP later on. Even if G.fast arrived here I doubt I would be able to get it as I may well be just outside of the range. Who care about rubbish g.fast? Also rip off far too expensive. I am happy stay with FTTC 80/20 for next five more years. Nice if you can get 80/20, but if not it makes the g.fast roll out even more of a farce. Surprised to see Aberdeen on the list. I wonder if it will eventually make its way to my exchange in the near future. I wonder if having Virgin now deploying FTTP in the area, This has spurred them on to compete? are they? or is it still just FTTC with coax from the cab to your house like 99% of the virgin network is. I'm unsure about the specifics of it to be honest. It's a joint venture with Cityfibre. And it is Vodafone, Not virgin as I incorrectly stated above. seems to be a confusing project. that link seems to be all about CityFibre (with no mention of Virgin), and then says the register your interest with Vodafone! Yes, I did say in the previous post it was my fault in the confusion between Virgin and Vodafone. It's a joint venture between cityfibre and Vodafone. Protect Lightning deployments by Virgin in new areas are full FTTP, with a coax conversion done at the property. It's much less than 99% coax. point was that most people think that Virgin is a true fibre network, when in reality it's no different the Openreach network (albeit coax from the cab than the just copper). that's clever advertising from Virgin though that has resulted in that. I've got a proper fibre to my house wall, where it is then converted to coax, all new areas are fibre, only areas where they are extending an existing coax area are done with coax I believe.